With 16 of 19 events scored, the Red River boys sat in 5th place at the Shanley Invite. By meet’s end, the Riders had shot into first place to win the meet for the third consecutive year. The biggest point haul came in the javelin, where the team had four placewinners and 22 points (1st-Seth Hanson-174’10/3rd-Liam Ogren-164’2/4th-Brett Klefstad-161’1/8th-Sam Schumacher-148’5). Hanson’s toss was a season-best and Klefstad’s performance was a state qualifying and personal best performance. Tyler Burian continued his fine senior season by hitting individual state qualifying marks in both the 100 (4th-11.33) and 200 (3rd-22.54). Both performances are personal bests and his 200 time now puts him #6 All-Time for the Riders. He also teamed with Maxx Andrade, Pierson Painter, and Josh Eagleton in the 4×200 (2nd-1:34.04) to qualify the relay for the state meet in Bismarck. Other state qualifying performances came from sophomore Bryce Enerson in the 110 Hurdles (2nd place), with a personal best time of 15.80. Enerson also placed 6th in the 300 hurdles (43.64-PR). Painter made his debut in the 300 Hurdles in impressive fashion, placing second and clocking 42.58, just off the qualifying standard of 42.14. The junior trio of Jake Arason, Zach Simon, and Thomas Hugo led a strong 2-3-5 showing in the 3200. Simon and Hugo both set new PR’s. Jeff Corcoran also dropped nearly 25 seconds from his previous PR in a great run. Sophomore Kaden Rohloff tied for 3rd place in the pole vault, clearing 12’0. Although he achieved the qualifying standard of 12’6 indoors, he will have to clear that height outdoors to officially qualify for state. Depth was the biggest story for the Riders, as no other athlete placed higher than 3rd in the meet. 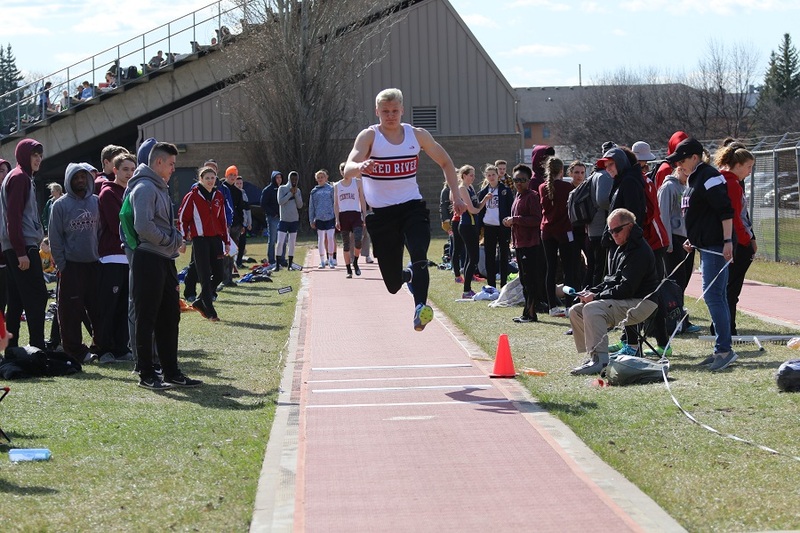 Big PR’s were found in the triple jump, where seniors Landon Haagenson (6th) and Tommy Stephenson (7th) both broke the 40’ barrier (40’2.5-40’1.5). Haagenson (19’7) and Enerson (19’7.75) also managed PR’s in the long jump. In the discus, Ogren hit an 11’ PR to reach 129’7 and place 8th. Freshman Tyler Larson (115’6) and senior Ryan Ostermeier (111’3.5) also continued their climb upwards. In the javelin, junior Cade Johnson threw 146’7, an 8’ PR. Enerson and Eagleton both cleared season bests in the high jump at 5’10. Senior Chayton Wocken posted a nice PR of over 2 seconds in the 300 hurdles, breaking 50 seconds at 49.40. In the 4×400 relay, season and personal best splits were turned in by Mohamud Yahye (53.3), Josh Eagleton (54.2), and Brady Dvorak (54.8). Alessandro Kroeger (56.8) completed the final leg, which placed 5th at 3:39.12. A handful of Riders traveled to Hillsboro Saturday for the first-ever meet on their beautiful new track facility. The group of 15 athletes placed 6th overall as a team. Junior Samir Bhujel was the top point scorer, notching 12.25 points after placing 3rd in the 110 Hurdles (19.09) and 4th in the 300 Hurdles (47.09). Sophomores Cole Ogren (2nd-144’8) and Justin Erickson (6th-131’8) both reached new PR’s in the javelin throw. Other big PR’s were found in the 300 Hurdles from Suraj Magar (49.52) and Ayam Gautam (51.44) and the 1600m from Kibrom Terefe (5:12.00). Junior Nate Pressnell placed 7th in the 400 with a personal best time of 56.51. On the track, new season bests were set by Gautam in the 110 Hurdles (20.75) and Spencer Riskey in the 200 (27.47). Field event PR’s included Alex Hrabchak in the long jump (16’1.25), Grant Richtsmeier in the discus (97’9), and George Rerick in the shot put (34’7). The busy week ahead has a group of athletes in Larimore on Tuesday. On Friday, the team will split squads, with most athletes at the West Fargo Packer Relays. Another group will travel to Sioux Falls for the prestigious Howard Wood Dakota Relays. The heart of the season is now, as the remaining three weeks will fly by in the lead up to region and state.